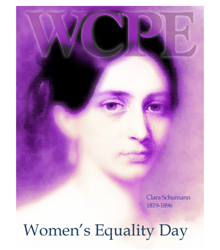 WCPE’s Music Director William Woltz announces a celebration of Women’s Equality Day, August 26, 2017. WCPE’s Music Director William Woltz announces a celebration of Women’s Equality Day, August 26, 2017. The event honors female composers, conductors and performers commemorating the passage of the 19th Amendment giving women the right to vote.